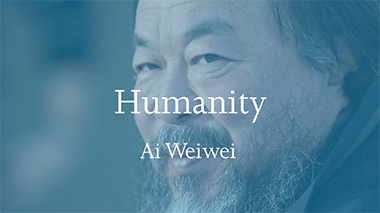 Artist Ai Weiwei speaks powerfully about the global refugee crisis in his book Humanity. My conclusion is we are one humanity. If anyone is being hurt, we are all being hurt. If anyone has joy, that’s our joy. People around the world are inspired by Ai Weiwei's work and words, and are contributing their voices to the conversation. Join the conversation and tell us what humanity means to you. Thank you for sharing what humanity means to you. We see the refugees’ misery on the news daily, so we know what is happening. At the same time, the pictures dull us. We think that the misery is so great that we cannot do anything about it. Nationality and borders are barriers to our intelligence, to our imagination and to all kinds of possibilities. We have to trust in humanity, not politicians. This problem has such a long history, a human history. We are all refugees somehow, somewhere and at some moment. Freedom is not an absolute condition, but a result of resistance. We have to remember we have no choice. We’re either on the right side or on the wrong side. The refugee crisis is a human crisis. We all have a responsibility in this. Join IRC supporters from around the world who have pledged to stand by people whose lives have been shattered by conflict and disaster and help them rebuild. Make a loan to a refugee on Kiva, a nonprofit platform for crowdfunding loans to small-scale entrepreneurs around the world. You can help refugees start or grow businesses, access financial services and create jobs, as well as support and assist host communities. Provide resettled refugee families with items they need to start their new life. Help the U.S. Committee for Refugees and Immigrants advance the rights and lives of those who have lost or left their homes, fighting alongside the uprooted on the path to independence. I am honored to count Ai Weiwei among my most important friends. I learn so much from him and I am really in awe of his contribution to the art world and beyond. I was first introduced to Ai Weiwei in 2005, thanks to a mutual colleague in Beijing. The prominent Chinese artist and dissident Ai Weiwei has long used his fame and social media as a megaphone for his activism. It was because of his blogging and Twitter activity criticizing the government that he was detained by the Chinese police for nearly three months and had his passport taken away in 2011. And his Instagram posts of the last few years have brought increasing international attention to the refugee crisis, as has his documentary Human Flow, released last fall. 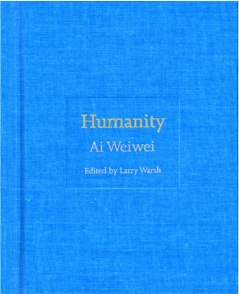 But now Mr. Ai has returned to a more traditional form of expression: Humanity, a little blue book . . . that collects excerpts from Mr. Ai’s thoughts and aphorisms. 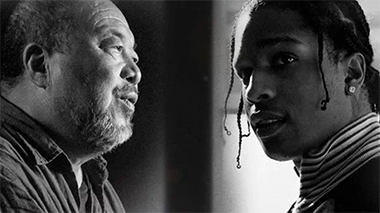 In his book Humanity, the Chinese artist Ai Weiwei, takes us on a meditation of sorts, from understanding through to action, via a series of quotations he has given in various magazines, podcasts, etc., around the world. . . . The quotes are presented and organized by artist and longtime collaborator Larry Warsh, who also writes the introduction, starting with the question 'What is our human obligation?' [Humanity offers a way ] to answer that question in light of current crises that are costing the lives of tens of thousands of people around the world. . . . Important reading. The movie theatre is almost empty. In the gift shop, a woman wearing large rose quartz earrings, a Del Kathryn Barton scarf, and a thin gold watch finally decides on Humanity. Ai Weiwei’s appearance in the flesh feels as if it’s an apparition. Yellow-clear liquid falls neatly into each cup, steam swirling. Turn the camera on. Never turn it off. Make sure you have extra batteries. The line is cotton-thin. Ai runs a hand over his face. It is an artistic masterpiece: an intricate patchwork of stunning camera work, close-range iPhone portraits, and wide aerial landscape sweeps captured by drone – unflinching, apocalyptic, uncomfortable, exquisite, and very, very real. What is the trait you most deplore in others? Insensitivity. Indifference about what is right or wrong. Indifference about justice. The book looks and reads like a series of short poems or Haiku. It is perhaps intended as an ironic parody of Chairman Mao’s Little Red Book. His topic headings consider humanity, crisis, power, borders and finally action. He looks at our human commonality and how that is plunged into disaster by the artificiality of partition and the misuse of power. Ai wants us to do something about it though, even if it’s only to speak up about the suffering of much of humanity. Here the contradictions of this now famous artist who has been accepted by the establishment can be seen. Ai Weiwei is the most important artist working in the most interesting country in the world right now. If he is finding it a burden, he hides it well. Notwithstanding a troubling spell in captivity last year, Ai refuses to be silenced. It is partly a matter of historical determinism: the world needs a prominent Chinese dissident around which to frame its reservations over that country's remarkable rise to power. For obvious reasons, that figure is unlikely to come from the worlds of business or politics. But Ai's resistance is also a matter of simple courage. Publishing a book of quotations is, of course, a political act in itself. 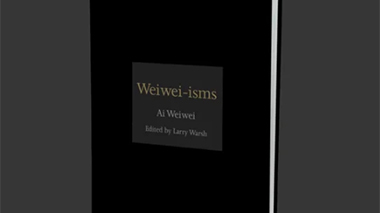 Weiwei-isms comes in a pocket-sized form with a simple black cover. It is deliberately the antithesis to the single most famous contemporary work to emerge from China: Mao Zedong's Little Red Book. 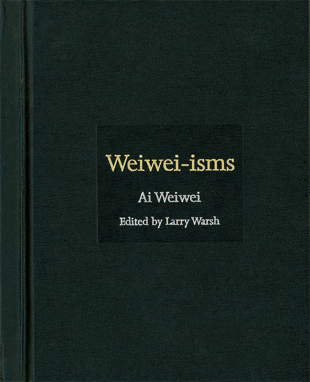 But if Mao's book was Chinese Communist Party propaganda, Weiwei-isms is the opposite. Its very existence points a middle finger at the Party which has frequently tried to silence the artist. Writings on human life and the refugee crisis by the most important political artist of our time. Ai Weiwei is an artist renowned for making strong aesthetic statements that resonate with timely phenomena across today’s geopolitically uncertain world. From architecture to installations, social media to documentaries, Ai uses a wide range of media to express new ways for his audiences to examine society and its values. Princeton University Press brings scholarly ideas to the world. We publish peer-reviewed books that connect authors and readers across spheres of knowledge to advance and enrich the global conversation. We embrace the highest standards of scholarship, inclusivity, and diversity in our publishing. In keeping with Princeton University’s commitment to serve the nation and the world, we publish for scholars, students, and engaged readers everywhere. Larry Warsh has been active in the art world for more than thirty years. He has collaborated with Ai Weiwei on several projects, including the public art installation Circle of Animals / Zodiac Heads (2010). Warsh is a former member of the Contemporary Arts Council of the Asia Society and the Contemporary Arts Committee of the China Institute. Copyright 2018 Princeton University Press.